Haupia — always with butter. 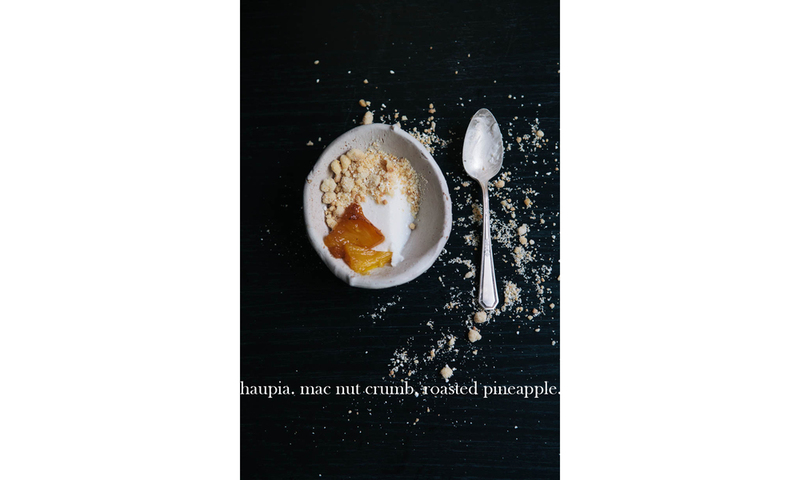 haupia with mac nut crumb and roasted pineapple. Gather a few bowls you will want to serve the haupia in and set aside. I used a few different sized ones, but should make 4-5 moderate portions. Whisk together sugar and cornstarch. Add in water and whisk until dissolved. Set aside. In a large saucepan, heat coconut milk over low until warm. Stir in sugar mixture. Stir constantly over low heat until thickened and coats back of a spoon, 5-7 minutes. Pour into bowls. Let cool on counter top until room temperature. Cover with plastic wrap and let chill 4-5 hours, preferably over night. Oven 350F. Line a baking sheet with parchment or a silpat. Mix AP, nuts, sugar, salt and vanilla together in a large bowl. Add in butter and cut in until small clumps form. You can use a fork or pastry cutter but I just use my hands. Break up over baking sheet. Bake for 15-20 minutes until lightly golden. Toss halfway through baking. Let cool completely. Oven 450F. Line a baking sheet with parchment or a silpat. Whisk brown sugar, orange juice and honey together in a large shallow bowl. Add in pineapple. Let marinate for 10 minutes, tossing occasionally. Place on the baking sheet in an even layer. Reserve the marinate. Bake for 15 minutes. Remove from oven, turn over each pineapple piece. Brush with the remaining marinate. Bake for 15 more minutes or so until pineapple has caramelized. Let cool completely. I first had haupia in Oahu in January at Ted's Bakery. It was encased between chocolate pastry cream and whipped cream; all held up by a flaky, buttery pastry crust. It was good, not too sweet and an ultra smooth texture. But I had one problem with it. I loath whipped cream. I have never liked it. It's on my list of no foods. So after scrapping off all the whipped cream, it was perfect. The beautiful location of the bakery and being on vacation, probably added to the allure. But it still has been stuck in my head, even after 6 months. So I looked up haupia and saw it was ridiculously easy to make. I knew I didn't want to make a pie, solely based on the fact that I really wanted something to photograph in these bowls. They are beautiful. A few chips here and there in some of them but I still love them. The one pictured in the first photo is such a tiny little thing, it just fits in the palm of my hand. The inside is quite rough and the glaze drips down the outsides.